Are You a Winslow? : Xavier Scott - "Freaks Like Us"
Long time saxophone player, Xavier Scott first picked up the saxophone at age 11 and has now been playing for 30 years. His technical prowess and creative agility are both apparent in his track "Freak Like Us." For the most part, he informed me that he likes to improvise, or in his own words, "I usually just record in one take and see what happens." This is an impressive and dangerous method of recording. It can surely go both ways between amazing improvisations that are captured in the moment or the treacherous pitfalls of aimless meandering. 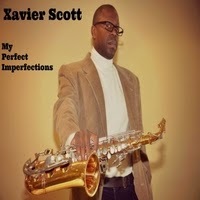 Xavier Scott does a great job of keeping things fresh and funky throughout his entire improvisations. On top of that, he takes the time to layer up his own horn arrangements as backing parts throughout the track. Large saxophone sections carry the progression through a turnaround and help to keep his improvisations moving forward. The execution of this track is fairly minimal consisting of a drum machine and layers of saxophone. I can appreciate the 808 beat that is the backbone of the track. It is reminiscent of a Marvin Gaye sound and keeps the overall feel of the track soulful and danceable while still being relatively down-tempo. Ed Roman - "Comin' My Way"
Chasing Jonah - "It Wouldn't Be Right"